It turned out the 1954 UAAP championship trophy has been gone for 16 years now, gutted in the major fire that hit the school's main building back on New Year's Day in 1998. 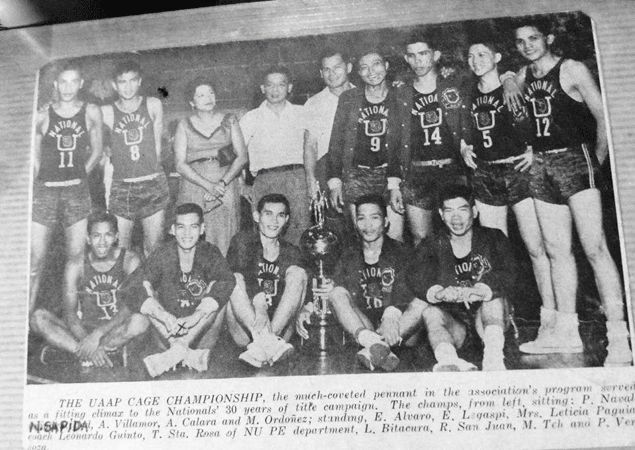 NATIONAL University has won two UAAP championships in a span of six decades - the first in 1954 and the second in the just-concluded season - but only has one trophy to show for it. Curious on where the 1954 trophy is now? Arlene Royo, who belongs to the family that used to own NU, said the trophy as well as clippings documenting the Bulldogs’ run to the 1954 UAAP title that were painstakingly kept by her mother, the late Leticia ‘Mommy’ Paguia, were all destroyed in the fire. “That was the time when the enrollment dropped because of the fire,” Royo related in a brief chat with reporters during the victory celebration of the school on Thursday night. Incidentally, Royo said the burned building was never reconstructed until 2009 when the SM Group purchased a majority stake in the school. An eight-story structure now stands in its place. At least, NU has replaced the burned trophy with a lot more, its teams having won championships in women’s basketball, men’s beach volleyball, men’s badminton, cheerdance, and girls volleyball in the first semester alone. Royo remembered she was just entering college when NU won the 1954 title. She was also a classmate of Nestor Sapida, one of the few members of that team 60 years ago still alive to this day. Royo said only a few schools were in the UAAP back then and the league had a different format where NU also played FEU in that championship game played at the Rizal Memorial Coliseum. “Iba pa kasi ang format noon. Walang Final Four. There was even a free-for-all during the finals,” said Royo. Royo said it wasn't only the NU community that celebrated the 2014 UAAP championship but also the entire Sampaloc neighborhood more popularly known as Bustillos where the school has stood since it opened in 1900. In fact, Royo said people living in the neighborhood were around to watch NU win the championship series at the Big Dome. Barangay officials also closed down roads in the campus vicinity during Thursday's victory party. “We have a family atmosphere here,” said Royo.